There are several of brands of epilators, some are more popular brands, but others are not that well known. We tested the brands that most customers are familiar with. All of the brands have shifted from coil based technology to tweezers based technology. There is only 1 coil based epilator that we tested. Today’s epilators work by having little metal openings that rotate on the epilator head. As the head spins around really fast, the plates open and close, behaving like tweezers. While the technology is the same, the performance can vary a bit. Which one was the best? Find out how each performed by looking at our reviews on epilators. Not every brand we looked at offers a wet and dry model. Here is a rundown of all the brands we tested and some of their features. 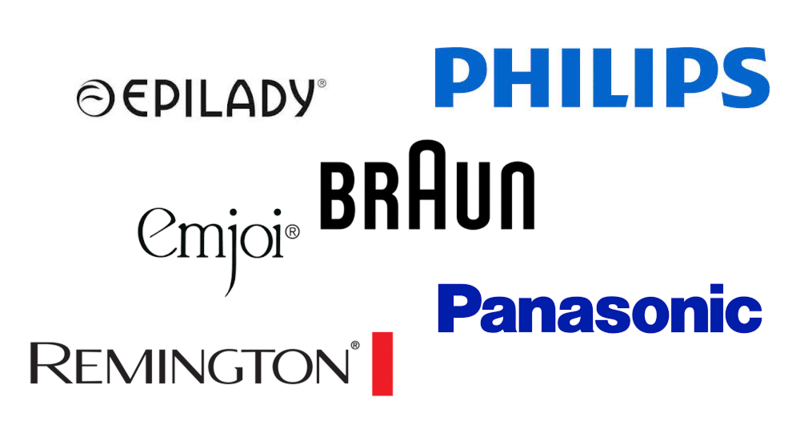 Braun is a German subsidiary of Procter & Gamble. In addition to making shavers for men, they also make epilators designed for women. According to Gfk, their epilators are the most popular epilators in the world. In 2009, the Silk Epil received the Red Dot Design award. Currently, Jessica Alba is the spokesperson for the brand. Braun has several different models in their line of Silk Epil epilators. There is the Braun Silk Epil 3, Braun Silk Epil 5, Braun Silk Epil 7, Braun Silk Epil 7 Skin Spa, and Braun Silk 9. The Braun Silk Epil 5 and Braun Silk Epil 3 are dry models while the rest of them are wet and dry models. In each line, there is a base model with just the basic epilator head and no additional accessories. If you move up in the lines, you can find different attachments for the face, underarms, and bikini area. There is even a trimmer that trims the hair to the correct length for epilation. Braun epilators include a massaging cap which is supposed to reduce the pain. The Spa models include an exfoliating brush to that is designed to prevent ingrown hairs. Braun has just recently launched a model designed specifically for the face, the Braun Face. Based in Secaucus, NJ, Panasonic also has a range of wet and dry models. Its epilators feature a skin protector which is designed to reduce pain. Like the newer Braun models, their latest models feature both an epilation head for epilating and a body brush for exfoliating the skin. Their current model is the Panasonic ES-ED90-P. It includes six attachments including a foot filer. Norelco is a subsidary of Philips. Philips is based in Stamford, CT, and makes a line of epilators for women. They have epilators for every price range. For basic epilation they offer the Philips 6401. This epilator features 21 tweezers. Their mid range epilator is the Philips Satin Soft Hp6520 clocking in with 21 tweezers. At the high end, they offer the Philips Hp6576 Satin Perfect Epilator with 32 tweezers. This is the only model with ceramic tweezers. Based in Madison, WI, Remington is a subsidiary of Spectrum Brands. Remington makes a wet and dry epilator designed for the face and body, the Remington Smooth Silky Epilator. The company makes a tweezer based epilator for the face as well. Emjoi probably has the widest selection of epilators. We can’t list all of their epilators here so we will just the popular ones that we tested. They have a product line of epilators designed for the face and even an epilator for men. There is the Emjoi Epi Slim+e18, Emjoi Soft Caress, Emjoi Epi Slim Epilator, Emjoi Divine, Emjoi eRase e60, and the Emjoi Emagine. They have other models that are similar to the tested models. Epilady designed the first epilator which used coil based technology. They make both body epilators and facial epilators. Their newest epilator is a wet and dry model called the Epilady Epiflex. It is the only dual head and dual motor epilator on the market. For the body, they also make the Epilady Legend 4, Epilady Speed, and Epilady Waterproof. For the face, the company makes the Epilady Esthetic, and the Epilady Face Epil. The Epilady Esthetic is based on the old coil technology. In addition to the major brands, there are a ton of not very well known brands. Why Aren’t Epilators More Popular?